Ten people allegedly kidnapped by unknown men armed with bows and arrows from the disputed Apaa land are being held at Adjumani Government Prison (Openzinzi) in Ukisijoni Sub-county, Adjumani district, Acholi Times has established. The ten were kidnapped during renewed fights over the contested 40 square kilometer Apaa land which is claimed by both Amuru and Adjumani district. 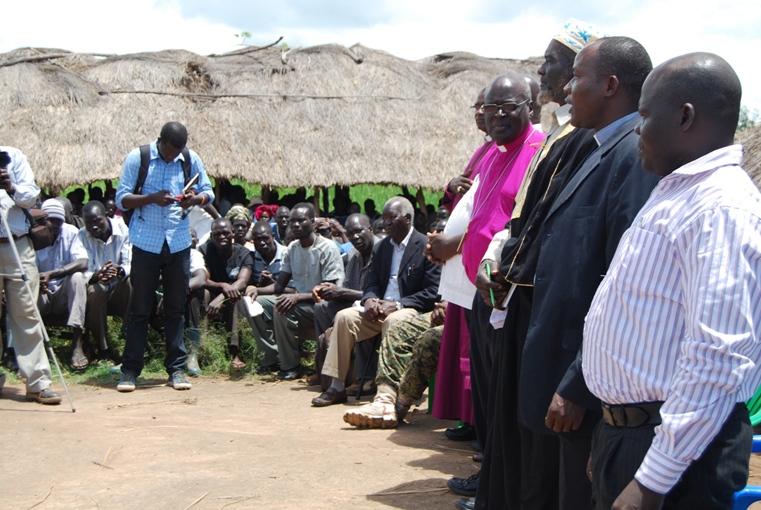 The ten are residents of Juka B village in Amuru. The detained are: Justine Owor, Richard Ojok, Geoffrey Otukwo, Godfrey Akena, Michael Ojara, Alfred Kilara, Okot Labalpiny, Walter Komakech and Benson Okot. According to sources, the ten were transported to Adjumani Police station, charged with assault and robbery and remanded to prison. However, a prison source at Openzinzi who declined to be named confirmed they have the Juka B residents. “We have those people from Apaa with us here except the first name (Geoffrey Otukwo) in your list… that we are not sure of,” the source said. Those at Openzinzi prison according to the prison source are: Justine Owor, Richard Ojok, Godfrey Akena, Michael Ojara, Alfred Kilara, Okot Labalpiny and Walter Komakech. David Ayella 35, who was among those kidnapped but released last week from Openzinzi prison said they were taken hostage men armed with bow, arrows and machete while on their way to their gardens. Ayella said the men ordered him and his colleagues to surrender everything in their possession before they were tied with ropes. “They told us that we are no longer wanted on the land in Apaa, they promised to torture us so that we don’t return on the land. They moved with us for some distance and later called a police patrol pickup that drove four of us up to Adjumani Police station,” Mr Ayella said. Police in Adjumani deny knowledge of the ten. Ayella said the kidnappers first planned on implicating them by claiming they were found in possession of marijuana but later changed their statements and instead accused them of theft. According to Ayella they were charged at the Adjumani Magistrates Court in Aulogo II Headquarters and remanded to Openzinzi prison on charges of theft and robbery. Ayella said he regained freedom after his relatives’ paid Shs 500,000 cash bail at the Adjumani magistrate court. A total of 48 huts were set ablaze when Juka B village was attacked last week by elements suspeccted to be from Adjumani. Amuru District Chairperson Michael Lakony told Acholi Times an interview on Friday that the district and families whose relatives have been detained do not have the resources needed to get bail. He put the figure of those languishing in Adjumani prison over Apaa at 200. These figures could not be independently verified by Acholi Times. “Each of these people need Shs 500,000 for them to be released on bail, the district through its lawyers have tried to secure bail but have been challenged by limited finance. We are however not giving up to help our people get out,” Mr Lakony said. “We are no longer mandated to talk about Apaa land issues, you can consult the office of the Prime Minister for more information,” said Cpt. Draga. Mr Julius Mucunguzi, the communication advisor to the Prime Minister said he would make a statement after consulting with Dr Ruhakana Rugunda. “I will give you a statement shortly after talking to the prime minister.” By press time, he had not yet issued the statement. Prime Minister Rukunda was tasked by president Museveni to resolve the conflict over land in Apaa. But Rugunda’s efforts is yet to pay off. On Wednesday last week, five people were admitted in Lacor Hospital after they were attacked at Goro B Village in Apaa while herding cows. Among the victims were Ronald Tibingana and Matia Musisi. The attacks follow a week of escalated attacks on residents of Goro B and Juka villages by men armed with spears, arrows, bows, knives and axes.